Norman and his Public Relations committee of NEOCH decided that we needed more attention to homelessness and the work of the Coalition. They worked with Brent, one of the best graphic artists in the community, to put together the above postcard. 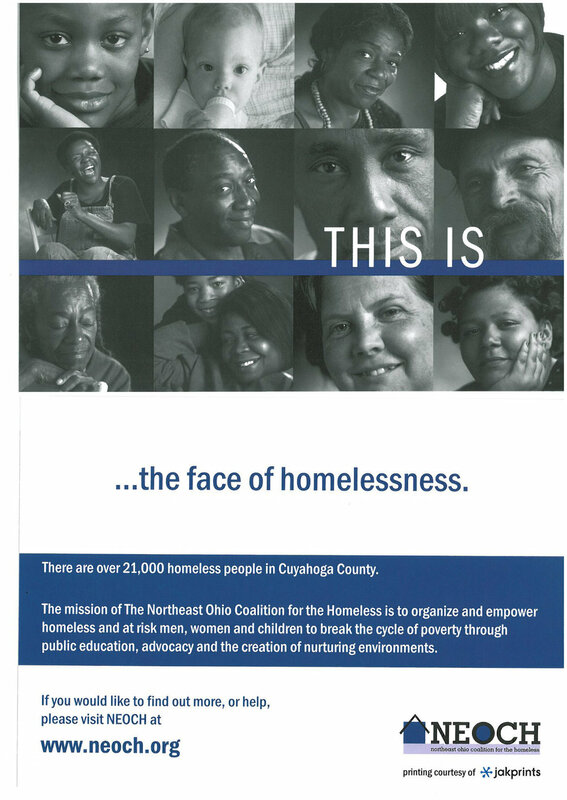 We used David Hagan's portraits of homeless people from the 2005 show that he did. He took beautiful portraits of homeless people and we had a show with their images. He gave each participant a framed portrait that they could hang when they got stable in their housing. Remember, the majority of homeless people are without housing for less than 30 days. Anyway, Randall from the NEOCH Board convinced Jakprints to print the postcard, and we are now distributing them around town. We hope to raise awareness of the work of the Coalition by directing people to our website. We also hope to change the impression that homelessness is not just the guy sleeping outside on the steam grates. There are elderly, young moms, veterans, children, and all different races of people who have become homeless. You are welcome to pick some up at the office or we can send them out to you.